I love that more and more studies are coming out backing up the idea that Fibromyalgia is a nerve disorder (or neurological issue) . A couple of studies now have shown that about 50% of those diagnosed with Fibromyalgia also have small fiber polyneuropathy. I had the test done a while back and it came back borderline (enough so that my Neurologist says I have it). This latest study goes a little further and while it’s small it supports the idea that Fibromyalgia is a nerve disorder. This 2015 study by Ramirez et al looked at the nerves in the eyes of Fibromyalgia patients. Why? Because they eye – specifically the cornea – has the highest density of nerve fibers in the body (which equates to the most sensitivity). No wonder it hurts so much when we get an eyelash stuck on our eye. A new imaging method allows doctors to non-invasively look at the nerve structure of the eye. It works with a software set that estimates the total number of nerves in a small area (square millimeter). This study first looked at the nerve structures in the cornea, and then correlated the nerve density to responses from standard questionnaires regarding patient pain levels, sleep quality, anxiety, depression, fatigue, and neuropathic pain. This was a very small study (only 17 Fibro patients and 17 healthy people). A single ophthalmologist examined the images of all participants. This is important because it ensures accurate comparisons. This ophthalmologist did not know which eyes belonged to the Fibro group or the healthy patients. The ophthalmologist looked at stromal nerves, examining average corneal nerve thickness, smoothness, and corneal sub-basal plexus nerve density. The Fibromyalgia patients evaluated in this study showed severe symptoms based on the questionnaires. When comparing the nerve thickness, Fibromyalgia patients have significantly thinner corneal stroma nerves than the healthy individuals. Nerve smoothness values were also significantly lower. Fibromyalgia patients also displayed decreased sub-basal plexus small nerve fiber density. While Fibromyalgia patients showed significant differences from healthy controls, there was no correlation between symptom severity among the Fibromyalgia patients and their specific nerve results. 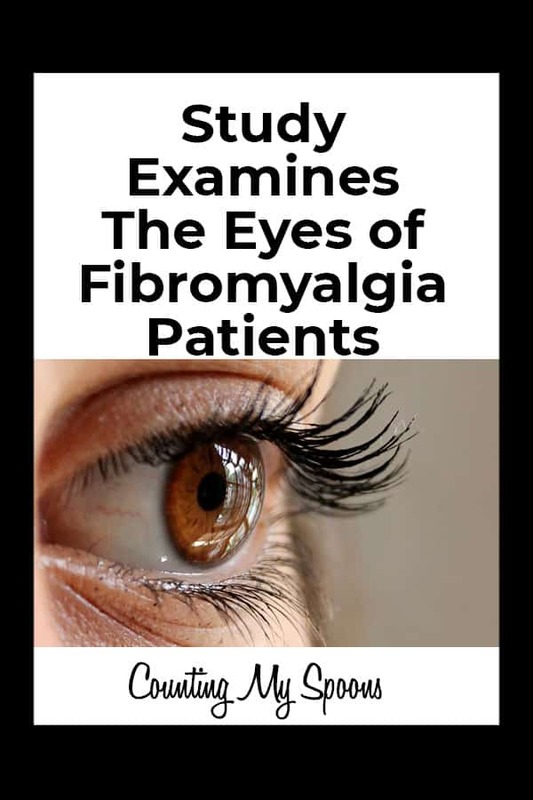 While the study is small it does indicate that Fibromyalgia patients have both smoother and thinner corneal nerves than healthy individuals, and that the small fiber neuropathy seen in other areas of the body is present in the eyes as well. I think perhaps if this study is expanded we may see a much simpler way to confirm small fiber neuropathy as it relates to Fibromyalgia. The current test for small fiber neuropathy requires cutting small holes in the skin. While the holes they cut in me have “healed” they were still visible, red, & itchy 6 months after I had that test). I see my ophthalmologist annually for the many eye problems that I suffer related to Fibromyalgia and I can’t help but wonder if this might not shed some light on those issues. Hopefully these researchers or others will expand on this study so that it can reach a point that can be considered useful in diagnosis and further research of Fibromyalgia. Right now it does seem to shed a little more light on the focus of Fibromyalgia as a nerve disorder. Ramírez, M., Martínez-Martínez, L. A., Hernández-Quintela, E., Velazco-Casapía, J., Vargas, A., & Martínez-Lavín, M. (2015, October). Small fiber neuropathy in women with fibromyalgia. An in vivo assessment using corneal confocal bio-microscopy. In Seminars in arthritis and rheumatism (Vol. 45, No. 2, pp. 214-219). WB Saunders. It goes back to we have to be our own advocates and chase the leads ourselves. If we just take what little info the doctors hand us we have nothing. Thats interesting about the dry eyes, as I too was recently diagnosed with that. The doctor said my eyes were so dry, they actually had dry patches on them. He thought it may be tied to my thyroid, but wasn’t certain. At any rate, he recommended an otc vitamin supplement and I was happily surprised at the relief in symptoms (took about 10-14 days to notice a change). I never thought to tie the dry eye to the fibro itself. Thank you for posting such helpful and interesting information! What vitamin did he prescribe? It’s called MaxiTears. They carry them on Amazon, and I know I’ve seen them other places–but I don’t remember where right now. One word of warning though–while they do not give me any type of heartburn or other common fish-oil complaints, the vitamins themselves are HUGE. They are a soft gel, so they cannot be cut. But I didn’t even know I had dry eye (I too would get those stabbing pains occasionally), and I can tell a difference. So are they basically just fish oil? I have noticed that since I’ve upped my fish oil intake the dry eye issue hasn’t been nearly as bad. I believe so. I remember he said they were also good for the heart. I’m not a big vitamin/supplement taker (call me a non-believer after too many raised hopes), and haven’t compared the ingredients in these vs. some other fish oil capsules. My guess would be that any would help, but I really don’t know. I was just pleasantly shocked that I noticed a difference with these. I can understand that. I’ve tried a lot that didn’t help, but have found a few that definitely do. I don’t usually leave comments but I just wanted to let you know how much I look forward to receiving a notification that you have posted something. Reading it and then some of the comments. Thankyou for taking the time to do this and thereby letting fellow fm sufferers know they are not alone. I’m currently being diagnosed with coeliac disease, just to add to my ‘life joy’, but I’m taking it all on with a positive attitude largely because I found Counting My Spoons and knowing I’m not alone. Julie – thank you so much for taking the time to leave a comment. It means a lot to me. I’m sorry you are now finding out you have coeliac but I’m betting that getting that under control will likely help your FM symptoms also. Hi Julie! I have fibromyalgia and also have many eye issues. I have never connected the two. May I ask what eye problems that you have? Hi Sherry. When I first began having issues problems with my eyes were the first symptoms. I get stabbing pain in my right eye and my vision decreases randomly. I also have very dry eyes. The doctors first thought I may have optic neuritis but that was ruled out. I’ve since been diagnosed with cluster headaches (the stabbing pain in/around my eye). The dry eyes are still unexplained as are the random vision drops (but the latter may be related to migraines also). I’m sorry you are also dealing with so much. Please keep in touch.